Following on from Joby’s popular Ori Case for iPad 1. They have announced they expect the new vesion of the Ori Case for iPad 2 to be available by June 2011. 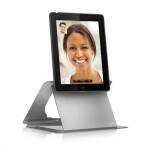 Joby expect the Ori case for iPad 2 to be just what the iPad user needs.